Make 1950s Playsuit-Back in the day (1940s & 1950s) playsuits were all the rage, so we decided to make 1950s playsuits for our "Summer Retro Party". Both playsuits functioned well and were comfortable all day. 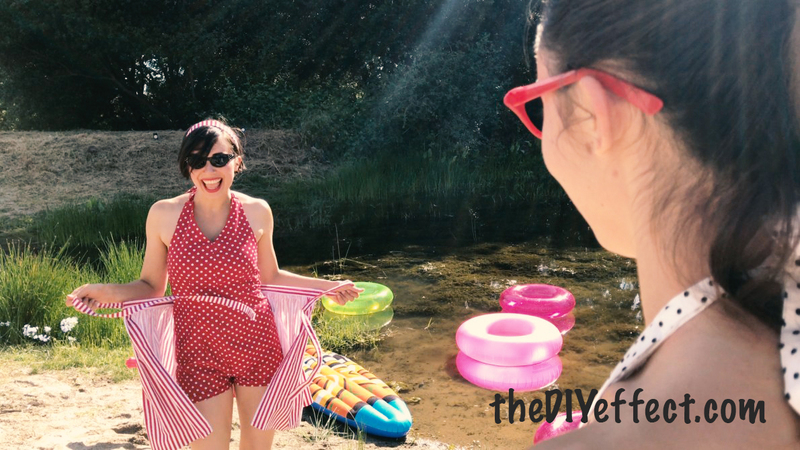 Check out the "Summer Retro Party" for a fun skit with a big surprise! 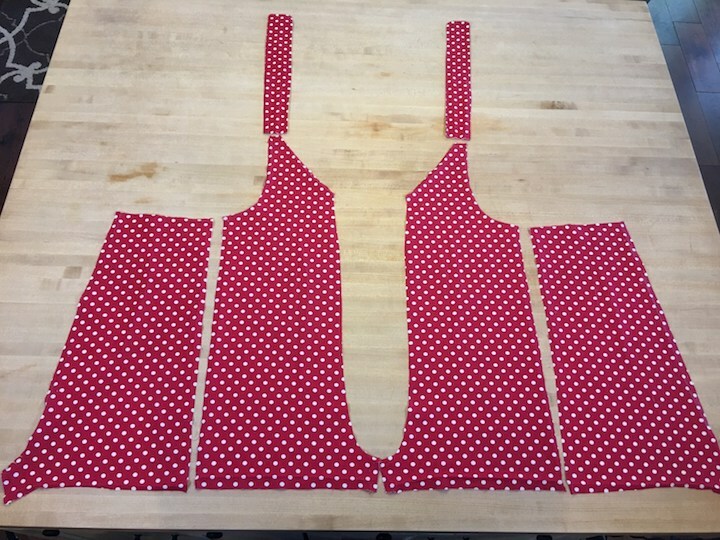 We made the white with black polkadots (above) first as a dry run, then made the red one with white polkadots (below). We filmed the process for a spring video on the thediyeffect.com. Check the blog for updates or subscribe for free e-zine of upcoming DIY's. Until then, check out the step by step tutorial below. 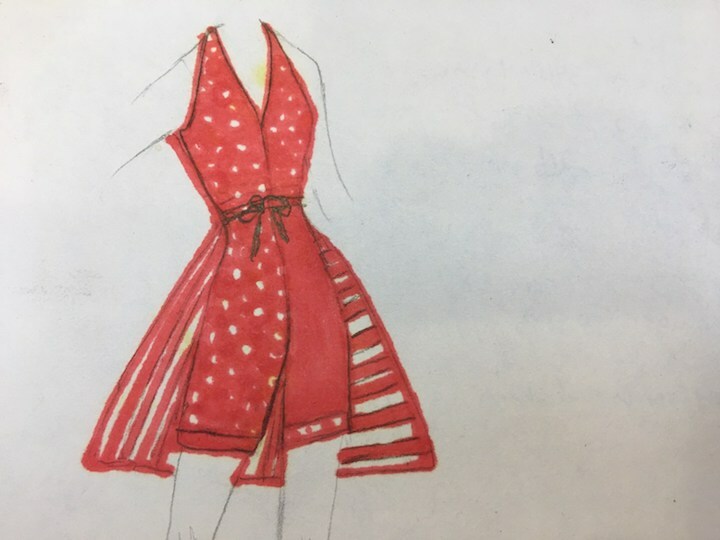 Inspiration below: The 1950s playsuit in the photo below is the vintage playsuit pattern we wanted to use for our 1950’s playsuit, but we couldn't find the pattern. We like the seam in the middle, zipper in the back, and halter top. Of course the skirt and romper were favorite parts of this look too. The idea that you could go to the beach, then put the skirt on and go to dinner was so cool back in the day, and still is. This skirt was so easy we didn't even use a pattern. Before making the skirt check out the video on "Sew Waistband" for a refresher on skirt waistbands..
Making the pattern: Since we didn't find the pattern, we put together our own pattern by combining a couple of commercial patterns. 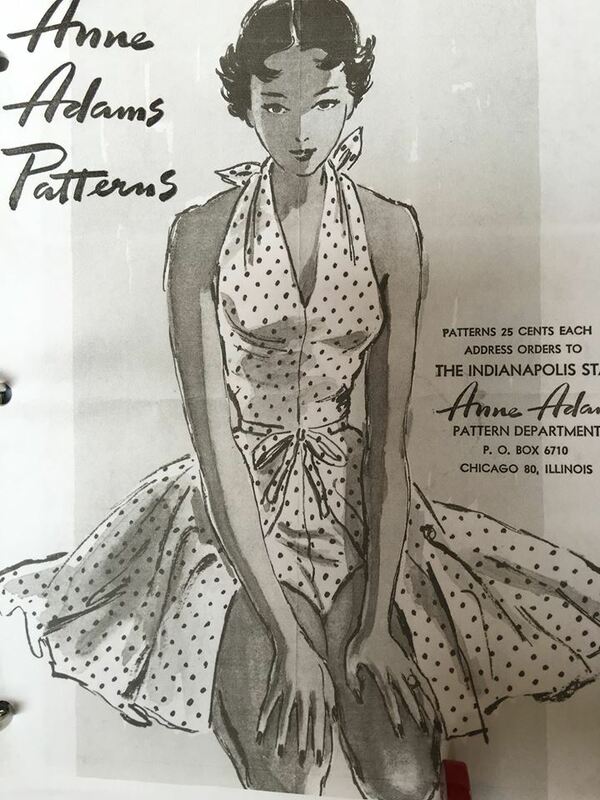 First we traced a figure off a commercial pattern. 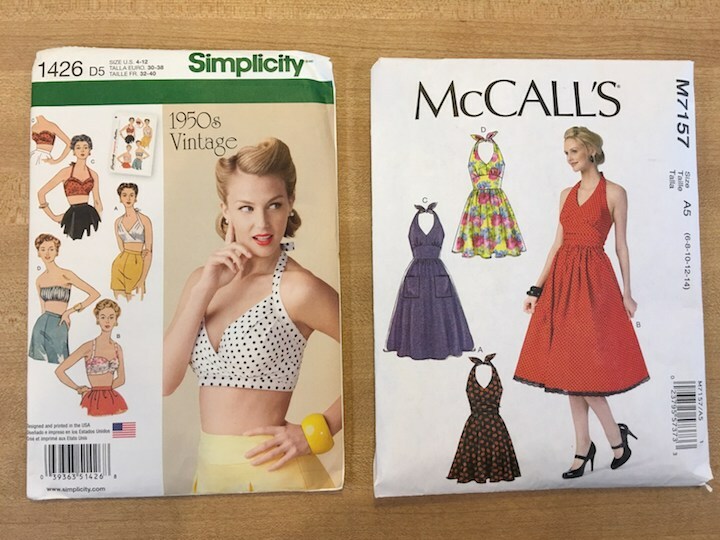 We used the neckline from the dress on the right and the shorts from the pattern on the left to make the bottom of romper. This is what we came up with. Tracing a pattern figure makes sketching a breeze. Measure around waist, waist length, bust, and hips. Compare body measurements with the pattern. Check twice, cut once. Add a 5/8th seam allowance to all the pieces. 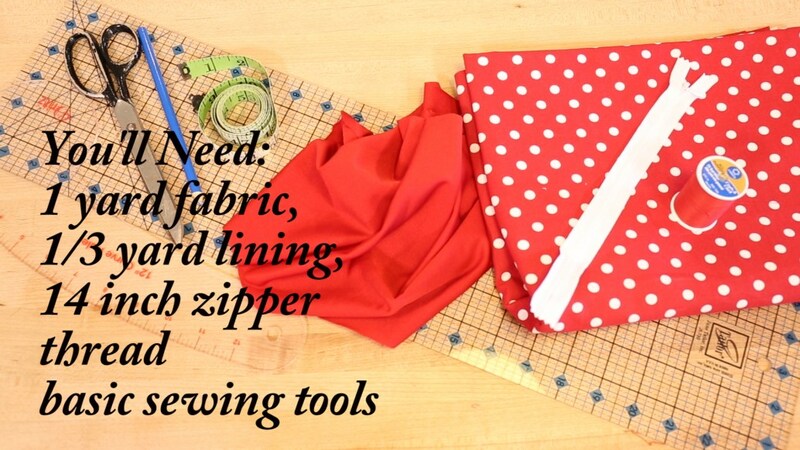 Some intermediate sewing skills would be very helpful here since we will be installing a zipper, lining, facing, straps, darts and making our own pattern. Layout fabric, right sides together and pin pattern to fabric. Label each piece in the seam. Front seam, back seam, right side seam, left side seam, zipper, neckline, straps. This will make it so much easier when putting together. 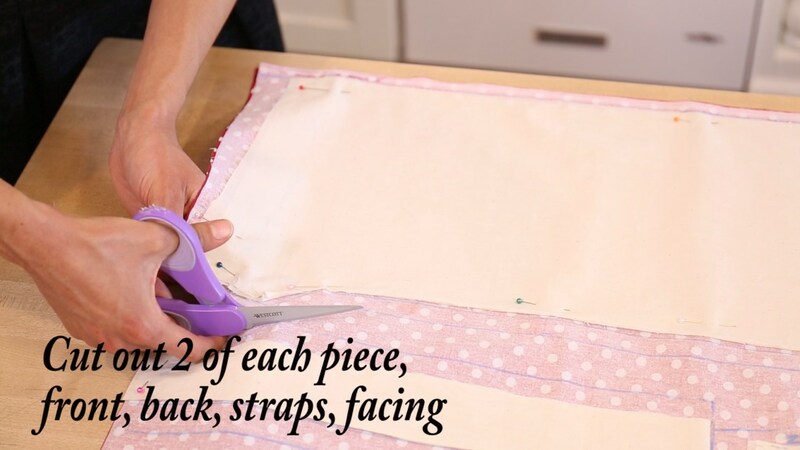 Cut out – Once satisfied with measurements and markings, cut out 2 of each piece (front, back, facing & straps). For the straps that go around the neck, we cut out 2 pieces, each 6 inches wide by 16 inches long. This may be too long for some, but you can always shorten if needed. Sew Seams- For front, with right sides together, pin and sew front seam together from neckline to crotch (left photo). For back seam, right sides together pin and sew back seam together from top to crotch using a basting stitch. This is where the zipper will go. We will remove basting stitches after the zipper is installed and re-enforce the seam below zipper. Lining- Cut out lining exactly the same as the front top of the romper. Pin right side of lining against right side of fabric, and sew along neckline and armholes using 1/4 inch seam allowance. Leave the top neckline open at the top where we will insert the straps later. Now, turn right side out, press, and top stitch around the neck and armholes, leaving the top strap open for strap ties. We’ll do that last. Facing- This is what the finished facing will look like. With right sides together, pin and sew facing to romper. Top stitch to keep facing in place and give a finished look. With right sides together, line up front, side and back seams. Pin and sew front side seams to back side seams including lining. Sew right and left side seams together. Crotch-Pin & sew front and back of crotch together. Clip curved areas of crotch and press open. With right sides together, sew 3 sides, leaving one short side open. Turn right side out and press. Tuck strap into romper strap opening. Pin, press and top stitch. Try on inside out. Pin darts where necessary, mark, pin, sew & press darts. Make any final adjustments. We decided to put the darts in last, but you may choose to put them in early on, such as before installing lining. We used 2 yards fabric, co-ordinating thread, ruler, scissors, measuring tape, pins, fabric marker, measure gauge. Cut out two pieces of fabric for the skirt ties. Each 24 inches long by 6 inches wide depending on your size of course. Gathering: Sew two basting stitches 1/2 inch from the top and 1/2 inch apart, leaving a long tail on each end for pulling. 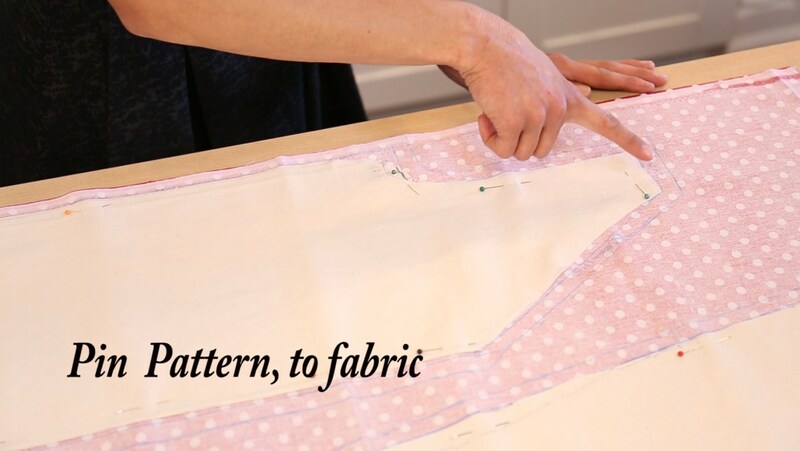 Pull threads from each end to gather to the desired waist size. 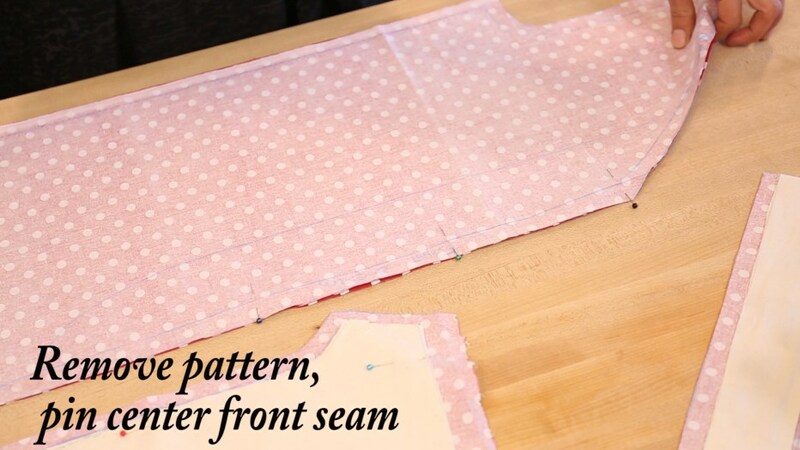 Back seam: With right sides together, line up right and left side of skirt to create back seam. Sew together using 5/8th inch seam allowance. Front ties- Cut 2 ties out using a 1/8 inch seam allowance. Sew around 3 sides, leaving one short side open. Clip corners or any excess fabric and turn right side out. Turn right sides out and press. The open end will be tucked into the front of the waistband. Front of skirt, turn in 1/2 inch, press and turn another 1/2 inch, press, and sew. Waistband: With right side of waistband facing wrong side of skirt, pin & sew to skirt. Press open as shown here. Press the excess inward for a finished look. Place the open end of the tie onto the waistband as shown here. Close waistband, pinning tie in place. Top stitch waistband, being sure to catch all the layers (skirt & waistband). Sew across the tie a couple times for extra strength.